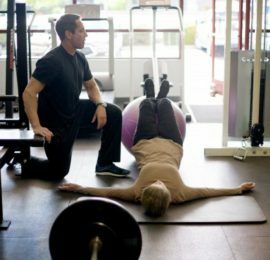 Framework Personal Training is a private, by-appointment fitness studio on Lakeside Drive here in Reno, and today, we’re excited to share a guest post written by Paul Fischer, the owner. He’s a patient of Dr. McSweeney’s, and we’re always impressed by his expertise. Today’s topic? Core conditioning for lumbar disc health. Take it away, Paul! For those of us managing a lumbar disc problem at the L4-L5 or L5-S1 level, proper movement and exercise can provide quite a challenge. We may have been prescribed or directed toward a core strengthening program, but where do we start? Knowledge is always a good place. The floor crunch tends to be the most basic go-to exercise, but this can worsen a lumbar posterior lateral disc bulge. With spinal flexion during a crunch, nerve root compression may increase. It’s worth mentioning that this problem does not exist on the floor. The challenge is presented when we are on our feet, attempting to manage our day. Crunches strengthen the rectus abdominis, but this is not the major stabilizer of the low back. The transversus abdominis increases intra-abdominal pressure by applying lateral traction to the middle layer of the lumbo-dorsal fascia. This traction creates an extension force in the flexed position (such as lifting an object from the floor). If the transversus abdominis does not function properly, the low back is at risk. So where do we start? We must first determine if the transversus abdominis is functioning with a simple test. Does the navel draw up toward the spine when picking up something light off of the floor, such as a sock? If not, we must start off with some activation exercises to awaken the muscle. A four-point kneeling activation exercise is one option. We must first isolate the muscle, and then integrate the muscle into movement. Floor planks can be introduced after activation is achieved. The next progression would be to the feet. This is where we need our abdominals to function properly to protect our low back. Standing wood chop patterns work well, as they stabilize and strengthen in all three planes of movement. These may be performed on a cable station, or with medicine balls. These are only examples, as there are many routes available utilizing the gym tools at our disposal. With proper assessment and proper exercise choice, proper core conditioning for lumbar disc health can be achieved. For more information, please don’t hesitate to reach out. We pride ourselves on a team approach to healthcare, and we’ll be happy to work closely with Dr. McSweeney to help resolve your issues.